What is it that people think and then talk about? In this highly connected world in which we now live in this question is vitally important. Why do consumer packaged goods brands like Coke and Pepsi continue to spend millions of dollars on advertising every year? Surely, at this point there are very few people who do not consume one of these products relatively frequently let alone have little to no knowledge of the brand at all. The same can almost be said for those durable goods companies such as Ford, Apple, and BestBuy. These companies enjoy a great amount of brand penetration into the market, but the purchase cycle for these products is very long and yet they also spend millions on advertising. The answer to this question is mindshare. When a consumer goes into a store to buy a product, companies not only want their products to be recognized when they are seen, they want it to be in that consumers’ mind before even walking into the store. If a customer is thinking about your product before they even look at the options, they will be more inclined to purchase the item. The second important part of brand awareness is mouthshare, or how much a customer talks about a topic, or in this case, a brand. The amount of time a customer discusses about a subject is related to how much they think about said topic and how important it is to them on an aggregate level. Thus the more a customer talks about a brand, the greater the chance they interact with that product and the greater its importance. In addition, talking about a brand serves to enhance brand awareness in other individuals thus furthering the cycle. 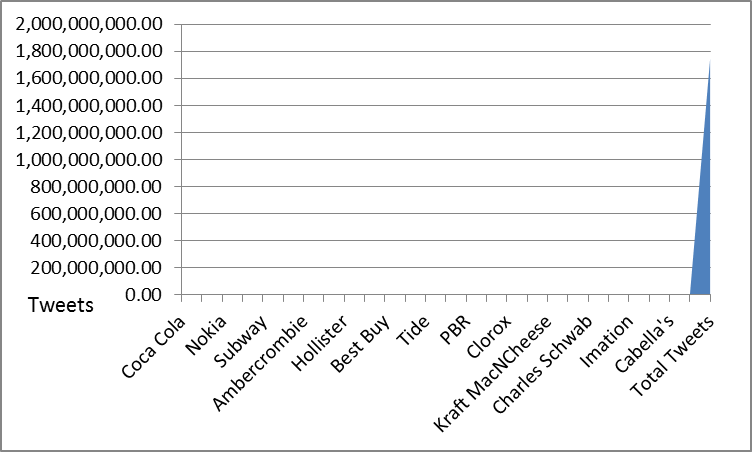 These top brands also all had approximately 10% share of our total tweets for the examined time with Coke obtaining an impressive 95,537 tweets. We can see that two of the five are clothing companies. While the brand of your clothing may be very important to a teenage girl, or some incredibly clothes conscious males, to a majority it is of primary importance that the clothes fit and look good. Even when the brand matters for their purchase decisions, it will infrequently makes its way into casual conversation. One is a tech company that, while it may be a global player in the industry, does not have a great amount of mindshare for the average person. All of this chatter is relatively small however compared to the fire hose that is Twitter with its average 250 million tweets a day. 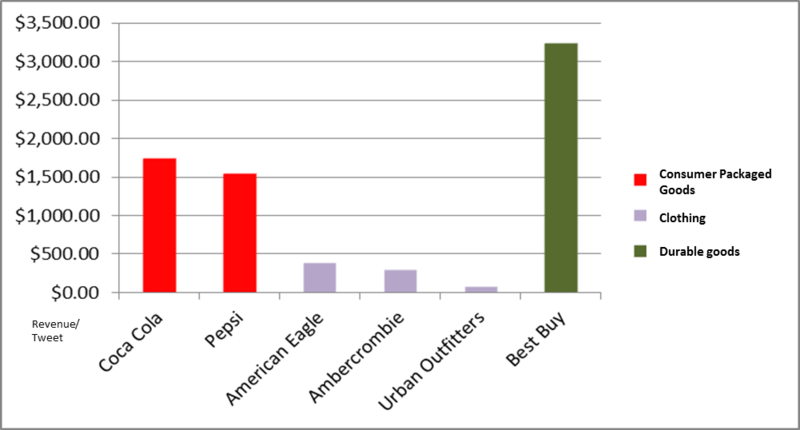 All of these brands together make up 0.049% of the tweets for the week period. Though while the percentage of the total stream is small,there can be an enormous impact on a given company. A single positive or negative tweet can be picked up by another person and retweeted hundreds if not thousands of times within minutes, which depending on the message can have a real fiscal impact on a company. Consumer packaged goods are consumed on a regular basis and their message is constantly advertised giving them a high revenue to tweet ratio. On the other end durable goods like those purchased at BestBuy while not a frequent purchase, elicit high consumer passion resulting in nearly twice as high of a revenue to tweet ratio. In the middle there is almost a dead-zone of consumer engagement with the clothing sector. Even these three well know and popular brands have a paltry revenue to tweet ratio of less than $400 each. With the proper understanding, the social media sphere can be a useful tool to promote and monitor a company’s mouthshare. A company that uses this knowledge can help to direct the fire hose of social media and not simply be washed away by it. Great data. Thanks for sharing. Are these behemoths of marketing reacting to, and capitalizing on this? If so, how? Peggy, not yet. We feel this is a novel measure of engagement for brands. This is the first time we’ve share some of the patterns of engagement we’re seeing. At Argus Insights, we are constantly working to bridge the qualitative and the quantitative and developing metrics that can be transparently traced to the bottom line. Even the biggest brands form a negligible percentage of consumer conversation on social media. The concern we have is that the brands will take this as an excuse to just shout more to consumers rather than understanding how to authentically and organically increase their share of mouth. In your own practice, how have you influenced the behemoths to leverage their powers for good?